This product will be no surprise to foosball playing enthusiasts. The ingenuity of creation is enough to want to own a foosball coffee table as a bonus for love of the game. There are a few known brands being sold, and Amazon is the perfect place to find them. Cost is relative to you being able to own an item of furniture, like this coffee table, which will enhance your game room or your living room. The Chicago Gaming Signature Table is excellent for adding class and dimension to any game room, living room or man cave. 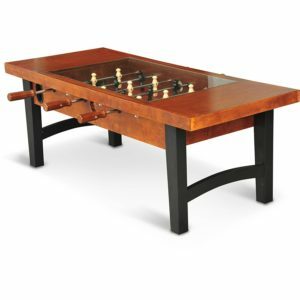 This table doubles as a coffee table as well as a foosball playing table and is ideal for wanting to keep things in its place. The table is made of solid hardwood with an incredibly rich coffee finish. Its playing field is made of quality wood which complements the playing men that are all hand painted. They are also made with cross-hatched toes that enhance intricate and difficult plays. The Chicago Gaming Signature Table is made with a stainless steel ball return and also has a built-in play through slots which channels the foosball back in play. Wooden scoring is also one of the many features of this product. Glass covering complements the foosball coffee table, and because it is a coffee table you are able to put drinks on without thinking of damages to the furniture. The craftsmanship of Chicago Gaming Signature Table is seen in the detailed carvings along the sides, which also enhances the wooden handles which are mounted on telescopic rods. To keep this foosball coffee table sturdy and fit for play are the leg levelers attached to the legs. There is also a bottom shelf for storage which comes in handy. Table dimensions are: 47 5/8” x 28” x 20”. This foosball wood coffee table is a Barrington line stock. It is similar to the Chicago Gaming Signature Table with all the mentioned features. Persons have given the Barrington Foosball Game Wood 42” Table as a gift, and the recipient just loved it. They indicated it is a great conversation piece and an easy play with friends and family. This Foosball Soccer Game Coffee Table is really a classic. It has all the makings of a very uniquely designed piece of furniture which is a very good conversation piece at any gathering. 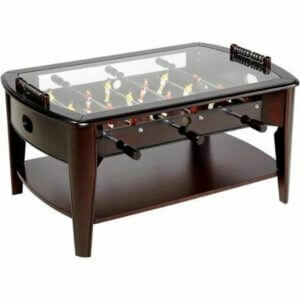 Lovers of foosball will find having this table in their living room or games room an added compliment. 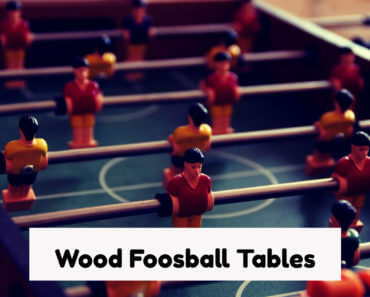 It is made of wood; with a sleek, soft, chocolate brown finish which has a built-in foosball game. The table is covered with tempered glass for viewing and playing the game, or for normal coffee table uses. It is made of wood; with a sleek, soft, chocolate brown finish which has a built-in foosball game. The table is covered with tempered glass for viewing and playing the game, or for normal coffee table uses. 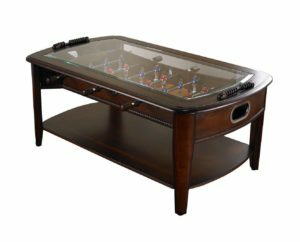 The cost of this table is relative in comparison to the many hours of fun you will have, either playing foosball or just lounging with a nice cold beer while entertaining. Purchasing a Foosball Coffee Table is an investment in fun and décor. Many persons have small apartments and are foosball enthusiasts, who really want to be able to enjoy the game without having to go to a bar. This table is also perfect for college, as you can have it in your room, to just blow off some steam during or after studies or a huge test. This kind of product is a unique answer to these situations. Of the three mentioned tables which Amazon offers, there are many other options to choose from. Going online and browse will help in your choices; however, Amazon offers the best deals and prices around. Foosball playing is an art that never gets old. It brings people together as family and friends and you may choose to play professionally, which is also fun. 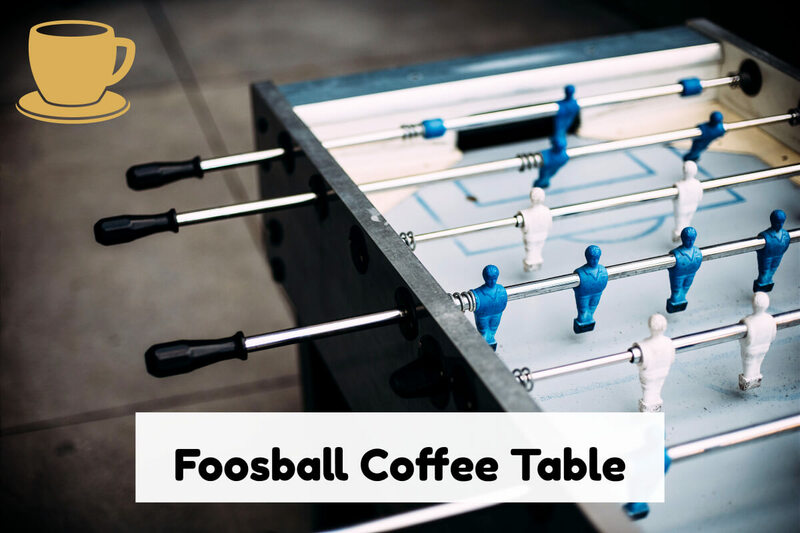 There are many brands of foosball tables on the market, but purchasing a Foosball Coffee Table which twins as a foosball game table and a general coffee table is unique. 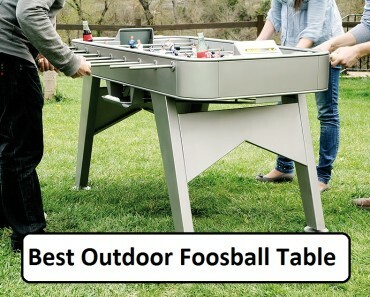 Persons who own a foosball table find it challenging to enjoy the game while drinking, and with this unique table, it is easy. You will not destroy or damage your table surface with spilled drinks or moisture, as the glass is there for protection. 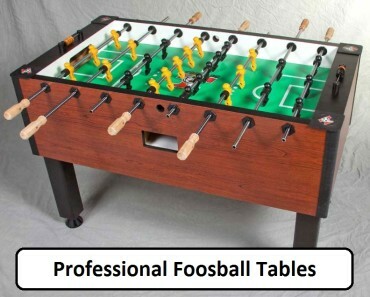 In relation to a foosball table, remember this is firstly a coffee table. There may be some restrictions during play as you may not be able to make wild and very energetic maneuvers. This is countered by owners, as they indicate; just having the table is awesome. The fun and many compliments got by friends and family make up for that little inconvenience during play. Another plus for having the Foosball Coffee table in the man-cave, it blends well with the décor, as one review indicates. It works well as the shades which the manufacturer does the finish is a plus. It does not stand out like a sore thumb. Investing in this coffee table is worth every penny you spend, and you can’t beat the quality with the material used.